Sixty-One Nails On Sale Today! Back in June, I reviewed Angry Robot's SIXTY-ONE NAILS by Mike Shevdon... just a reminder that if you are in the US/Canada and are interested in seeing the book, it's on sale today at a bookstore near you! Those of you who know me personally might know that I love train travel. I know that 21st-century trains have lost the romance of earlier train lines, locomotives, etc., but that doesn't stop me and my imagine from having a grand ol' time on any train ride. There's something about riding through slums and people's backyards and vast open fields and over rivers and through tunnels that I find eye-opening... but I digress. It seems that some great literary folk also fall into this love-for-trains category, and The Guardian recently collected a list of ten of the best railway books. Strangers on a Train has been on my radar for some time, and I've always loved Murder on the Orient Express. There were a few I hadn't heard of, and then I was surprised at the lack of Graham Greene - Travels With My Aunt (a spectacular read, by the way) focuses on a series of train travels. Any other additions? Have you read any of these? Recommendations? 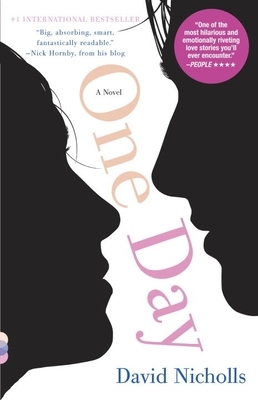 The kind people at Random House seem to have sent me two copies of David Nicholl's One Day, which I thoroughly enjoyed (see my review). Because even a booklover like myself doesn't need two copies of the same book, I have one to give away. This is an unread galley (not the final book). To enter, simply leave a comment below. Plus one entry for followers, plus one for sharing the contest elsewhere (Facebook, Twitter, your blog, etc). Please enter by midnight on Wed, Sept 1. I'll pick a winner on Thursday, Sept 2. Good luck! Happy Friday! In honor of the weekend, let's have a toast. No, several toasts. Oh hell, let's just play a literary drinking game or two. A few weeks ago, Jezebel featured an article on drinking games based on all of our favorite classics. The article stems from a NYTimes piece (also worth reading) in the Sunday Book Review that stated, "rules for drinking are not so different from rules for writing." I would argue that these games are only further proof that bookworms are not isolated people, contrary to the NYTimes article that I discussed in my Monday post, "An Engaged and Approachable Bookworm." As with all literary lists, some of these games are better than others. I rolled over laughing at a few, including David Foster Wallace (drink every time a sentence has three or more conjunctions) and Virginia Woolf (go buy some flowers, and then, if you have any time left, drink). I confess I've never been a huge fan of Woolf, though. James Joyce: Drink every time Joyce writes a sentence in stream of consciousness. Dan Brown: Drink every time a sentence lacks a subject, verb, or other essential component. Lord of the Rings: Drink every time someone goes into the woods or out of the woods. Any more? What game will you be playing this weekend? This blog is for people who do not have thousands of hours to read book reviews or blurbs or first sentences. I will cut through all the cryptic crap, and give you the meat of the story in one condensed image. 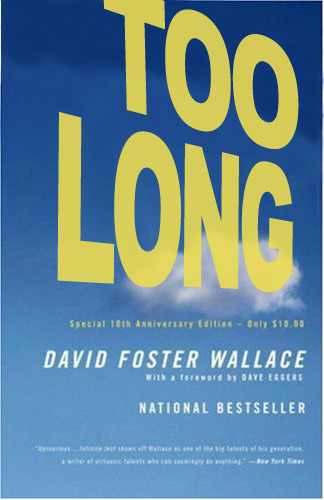 Now you can read the greatest literary works of all time in mere seconds! I've put a few of my favorites below, but there are many, many more to peruse if you're in need of some distraction. I'm sorry, but as a lifetime bookworm - and avid conversationalist - I couldn't disagree more. First of all, why single out readers? We're no more "isolated" than the man shouting a conversation into his cell phone, the kid playing on her DS or the college student with an iPod on. That said, I will agree that as a reader, I am not particularly open to strangers striking up conversations with me while I am clearly engrossed in my book. Ask me what I'm reading and I'm likely to show you the spine of the book as an answer - without ever taking my eye from the page. That's a question you can answer yourself, little to no detective work required. But say something interesting, something worth taking my attention, and I will, in the bat of an eye, put down my book and talk. Often about books. I'm not an unapproachable bookworm, but you best have something worthwhile to say if you plan to interrupt my reading. Maybe that does make me unapproachable to some, or maybe it makes me seem isolated, but I simply cannot agree that bookworms carry a stigma. Books bring us together, not the opposite. If you think differently, I'd say that's your loss. A Match Made in... Books? (from Rebecca at The Book Lady's Blog): Highlighting a new online dating website that matches users based on their book preferences, Rebecca explores what makes people - and readers - compatible. 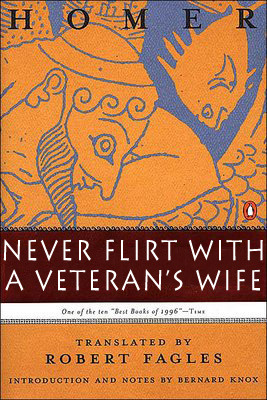 Personally, my fiance and I have vastly different taste in books (with the exception of Robert Jordan), and despite my pleading and prodding, I have yet to successfully recommend a book to him. But while our book choices might not be compatible, I like to think WE are (hence the whole marriage thing). Then again, he lent me Love in the Time of Cholera before we started dating, which definitely sparked something... so maybe it's not so far off base, after all. On the Shelf (from Karen at BookishNYC): Karen posts lovely pictures of libraries and shelving arrangements relatively frequently (reading her blog is worth it for these pictures alone, not to mention that I also enjoy her other posts), and I particularly loved this post featuring the luscious and deluxe home library of a NYC-based costume designer. Blurbs! Blurbs! Are They Important? (from Greg at The New Dork Review of Books): I always love Greg's posts. Always insightful, always thought-provoking. This recent post discusses the impact of cover blurbs - something I've often wondered about, especially after having been through publishing meetings in which we've speculated over who we could get to blurb a book. I admit, even with my cynicism, I am absolutely victim to picking up a book because an author I like has blurbed it. At the very least, it tells me about the genre/style/targeted audience of the book (i.e. 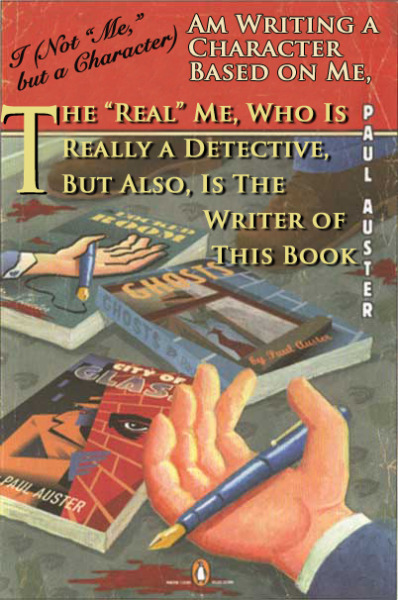 if Nora Roberts and Danielle Steel blurbed vs. Pete Hamill and Mark Helprin). What are your thoughts? Join the discussion over at Greg's blog. Enjoy the reading, and while your over there, I'd recommend following all three of these blogs. After a weekend spent unpacking, unpacking, and doing chores related to - you guessed it! - unpacking, this hits the spot for Monday morning. Many thanks to Nathalie Foy for posting this incredible rendition of the original WWII-era British poster, which read "Keep Calm and Carry On." It's from a parody site that allows users to create new versions of the poster (ingenious, much?). Excellent news, all: it's Friday! This marks the first in a new string of "Great Friday" posts featuring (as the title suggests) Great Photos. Today we have the world's cutest bookworm, as designated by Daemon's Books. I have to agree with the original post in saying that I'm not usually a fan of over-the-top baby pictures (think: Anne Geddes and the like), but this is just downright adorable. And those glasses! Happy Weekend! As always, I'm taking Saturday off, but Sunday will bring with it a new quote of the day, and regular posting has now officially resumed, so be sure to check back next week. I’ve developed a new addiction for audiobooks. Moving from NYC to the suburbs has meant sacrificing the hour-or-so of reading I used to get done on the subway each day – and that was just to and from work, not including any other excursions further into Manhattan. In order to make up for the loss of this precious reading time, I’ve turned to my local library – where would we all be without libraries? * - and opened up a world of books-on-CD. This isn’t my first foray into audio. I listened to Pride and Prejudice on my iPod last year (my fiancé even bought me really cool, big, red headphones for this adventure that are infinitely better for spoken word than the standard Apple earbuds). I also received a copy of The Swan Thieves on CD from Hachette Audio, and I absolutely loved it – both the story, and the audio edition (see my review here). That said, this is just the beginning of my journey into the world of audio, and it marks one of the resolutions I have made to myself not to sacrifice reading time in the mayhem of moving and starting a new job and wedding planning. Going forward, I will mark any reviews of books I listen to, and will review content as well as audio presentation wherever possible. Anyone else addicted to audio? How do you optimize your reading time? How do you decide what you’d like to listen to versus read? Stay tuned (no pun intended) for a review of Lies My Teacher Told Me (Audio) – I’m on the last CD of the book now, and then off to the library for the next selection! *That’s a question that could prompt a whole ‘nother post… or a string of posts… keep an eye out for this, I think I’m on to something. Internet abounds! And cable! And we even have a landline! Ok, I'm done with the exclamation points. But really, I am excited to be back. This is all I have for tonight, because I'm in the midst of unpacking my books (at long last!) and then heading to bed to start The Book Thief. I've read so many good things about it that I'm hoping it will distract me from all of the things that need to be done around here. I haven't finished a book in weeks - with the exception of some audio books during my commute, which I'll post about soon - and I'm itching for some quality page-turning. I'll try to post pictures of our book storage and my new reading corner (complete with my Gramma's oversized armchair) soon. For now, I'm off to unpack some more books! But I digress. The point of this post was simply to inform you all that because I am currently without internet in the house until next week, and am a bit crazed for time, I will be taking a step back and won't be posting until next Wednesday at the earliest (to celebrate my hopefully-then-working WiFi at home! ).